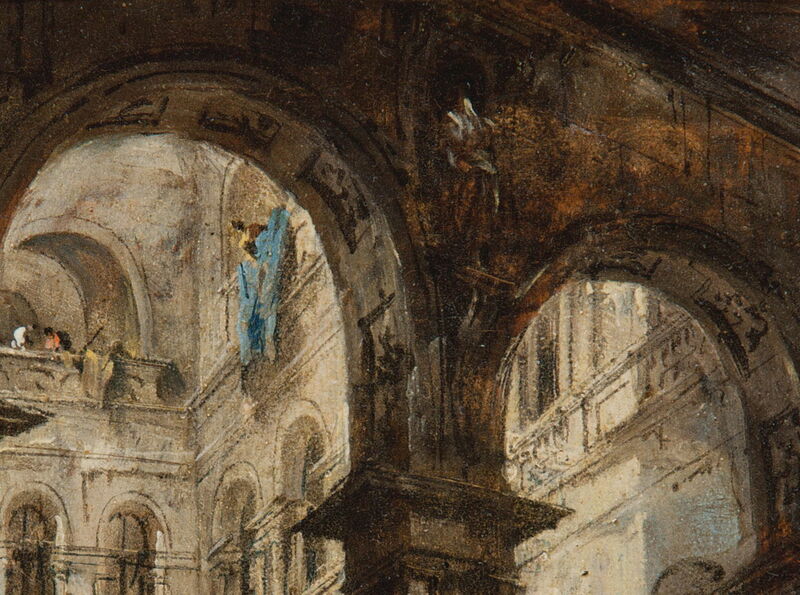 Francesco Guardi (1712–93), An architectural capriccio (detail) (date unknown), oil on wood panel, 19 x 15.2 cm, Art Gallery of South Australia, Adelaide. Wikimedia Commons. 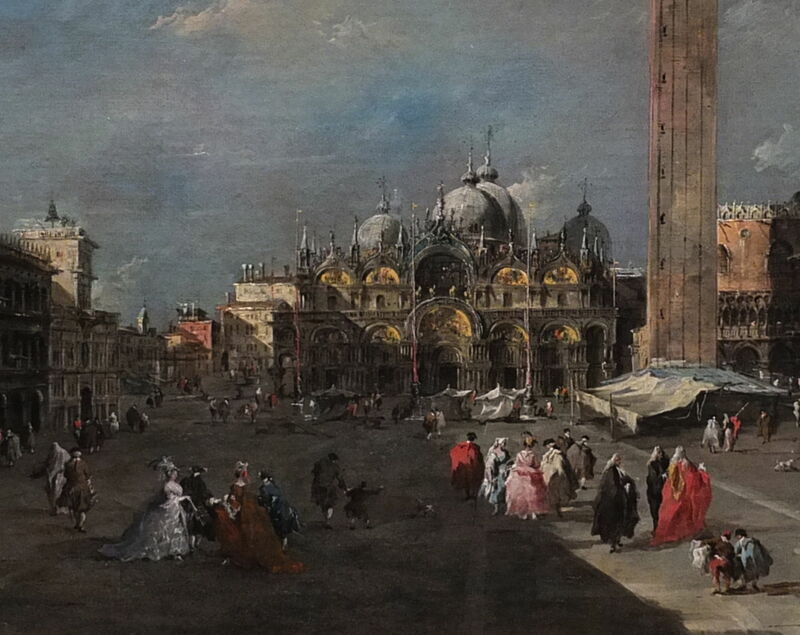 In the second article in this series, I remarked how in the latter half of the eighteenth century, a hundred years before the birth of Impressionism, the Venetian painter Francesco Guardi used very painterly marks in his views of Venice. 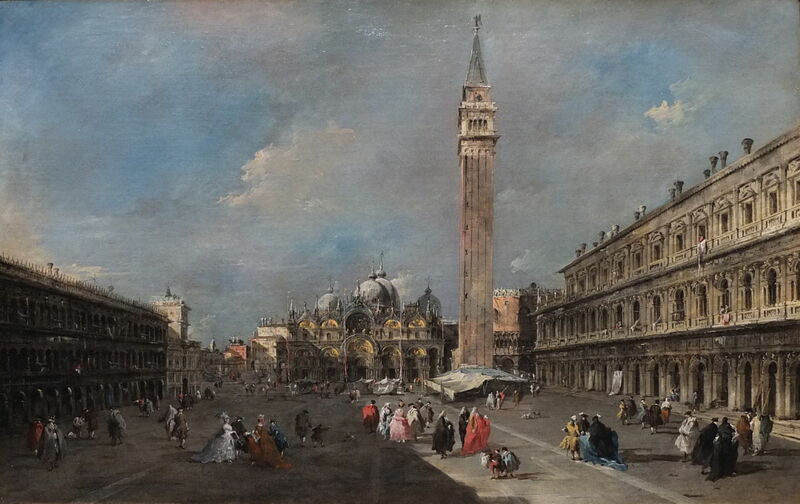 My example was a late view of the Piazza San Marco (c 1775). This fascinating painting is in the Scottish National Gallery, Edinburgh, and Guardi’s loose brushwork can be seen in a detail from it. 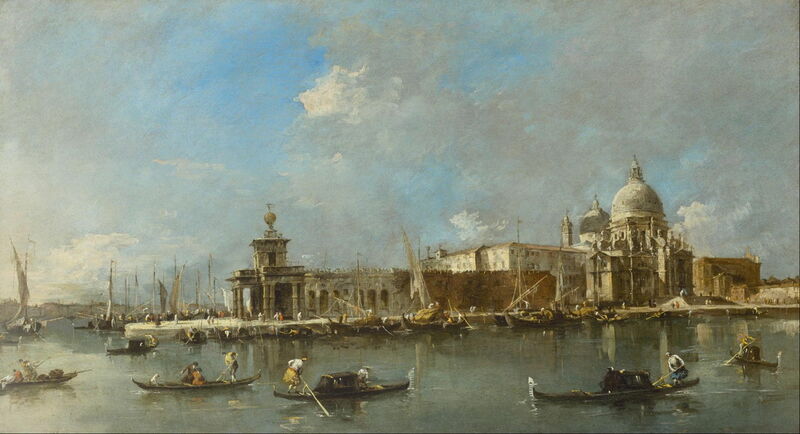 Since then I have been able to find out much more about Guardi and his painterly works. As he is not well known, and my sources are printed rather than online, I thought these might be of interest and relevance to this series. Francesco Lazzaro Guardi was born on 5 October 1712, the son of an established painter, Domenico Guardi (1678-1716), who had moved to Venice from Trentino. His sister married Tiepolo, and Francesco was inevitably apprenticed into the family studio. In 1735, he moved to work in the studio of Michele Marieschi, later returning to work with his older brother, Gian Antonio. In the period before his brother’s death in 1760, the two painted whatever they were hired to, and not particularly well, either. Several mythology paintings have survived, and in the main they appear to have been based on engravings made by others, for example illustrations for Tasso’s popular book Gerusalemme Liberata. 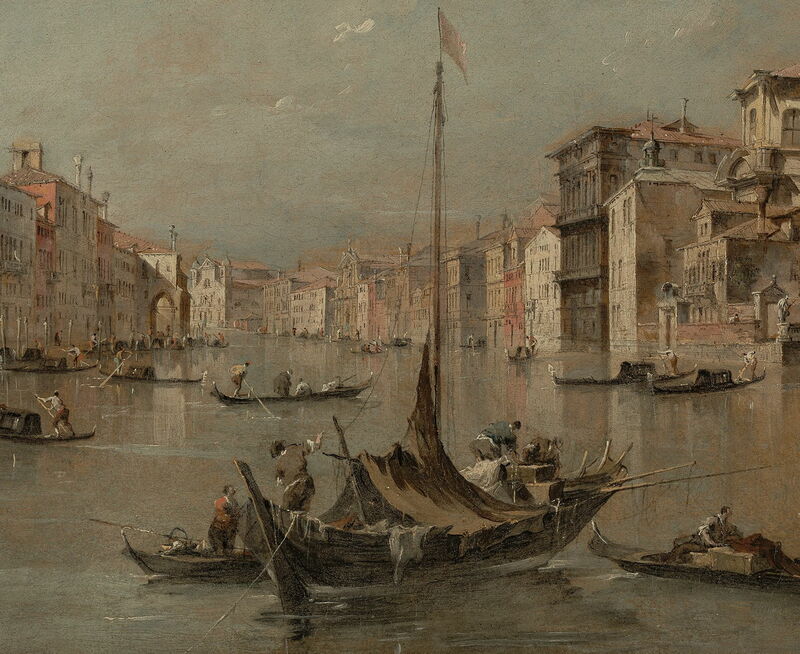 They did paint a few landscapes, but commissions for views of Venice were unusual at that time. 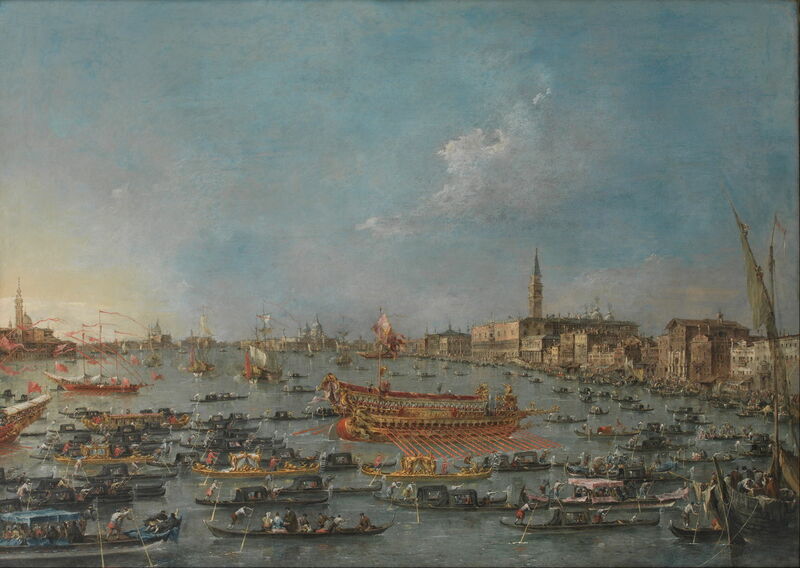 The rise in popularity of the Grand Tour, particularly among the British aristocracy, and the popularity of Canaletto’s views, brought a radical change to the market for paintings in and of Venice in the middle of the eighteenth century. Canaletto’s nephew, Bernardo Bellotto, left Venice to work in northern Europe in 1747, and Michele Marieschi died very young in 1743. Francesco Guardi therefore found more work painting views of Venice, which he sold to agents who sold them on to mainly British tourists. He also turned his brush to a developing market for capriccios, composite views which were often based compositionally on the works of others, but in which he incorporated his own free rendering of scenes which he saw around Venice. These were usually smaller works, of which quite a few have survived. He also enjoyed some commissions from the Venetian authorities. He was admitted to the Academy of Fine Art in Venice in 1782, and died on New Year’s Day, 1793, probably the last practitioner of the classic Venetian school of painting. As few of his works are signed or dated, and all are in need of more research, I am loathe to try to provide chronological examples of his works. This makes it difficult to establish when and how his more painterly style developed, unfortunately. 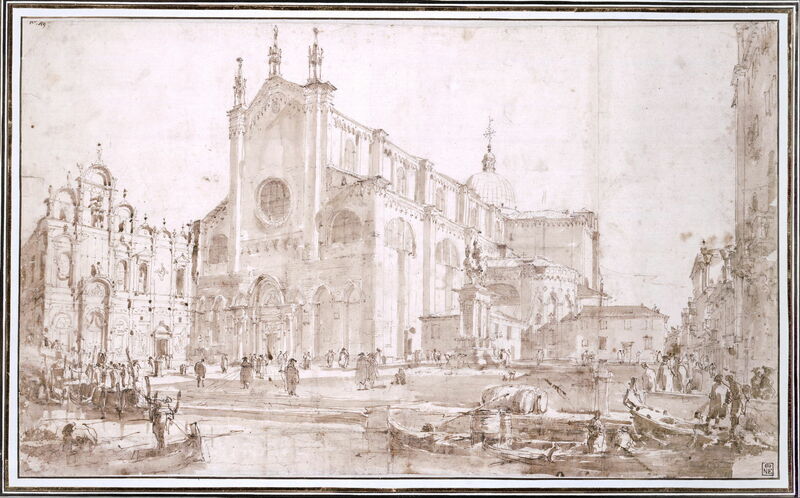 Campo San Zanipolo in Venice (1750-9) is a wonderful sketch which is full of marks and squiggles which show his very free approach to what might ordinarily have been a thoroughly rectilinear architectural study; it is remarkably modern in appearance. Francesco Guardi (1712–93) View of the Giudecca Canal and the Zattere (c 1757-8), oil on canvas, 72.2 x 119.3 cm, Thyssen-Bornemisza Museum, Madrid. Wikimedia Commons. 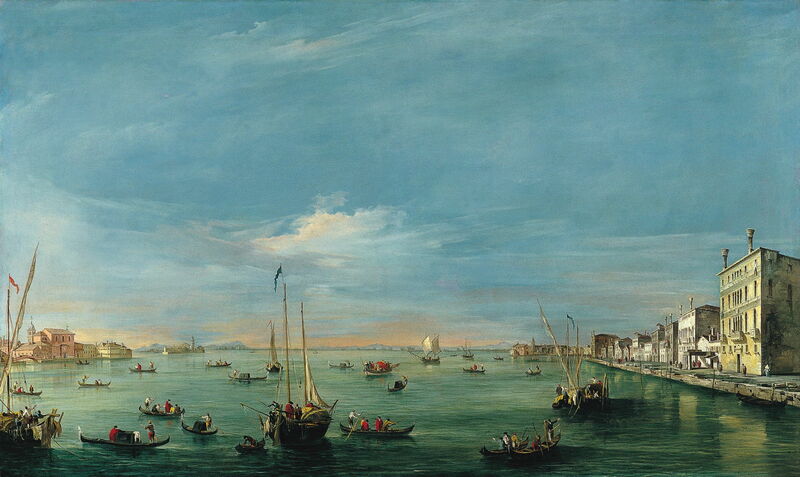 View of the Giudecca Canal and the Zattere (c 1757-8) is one of his earlier views, and follows in Canaletto’s tradition. However, the sea and sky have already become more liberated from Canaletto’s rather rigid precision: Guardi’s water looks much more random and natural, and bears fine brushstrokes, particularly in its paler lines. Francesco Guardi (1712–93), Gondolas on the Lagoon (Grey Lagoon) (1765), oil on canvas, 31 x 41.8 cm, Museo Poldi Pezzoli, Milan. Wikimedia Commons. 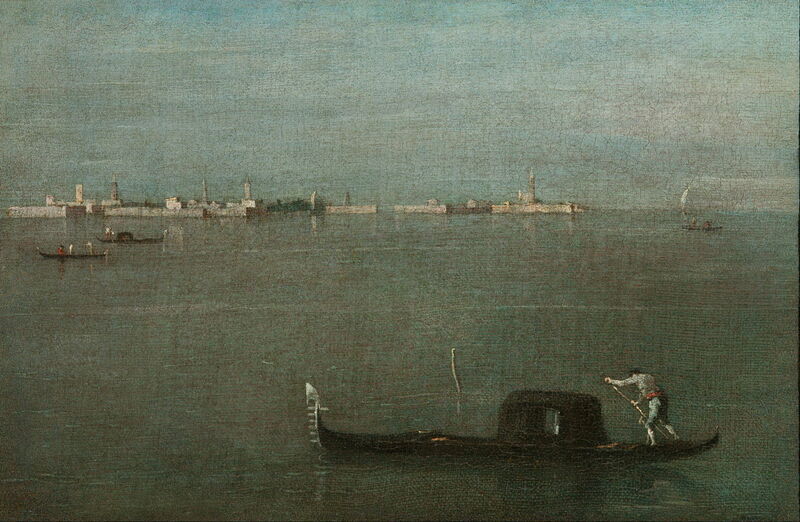 Gondolas on the Lagoon (Grey Lagoon) (1765) is less of a standard vedute, and perhaps more like the sort of painting which might have been produced by one of the Macchiaioli a century later. Some of the more distant objects, such as the sailing boat at the right, appear quite sketchy, although this is not particularly small in size. Francesco Guardi (1712-93), The Grand Canal, Venice, with the Palazzo Bembo (c 1768), oil on canvas, 47 x 76.5 cm, The J. Paul Getty Museum. Wikimedia Commons. By the late 1760s, Guardi’s brushwork was starting to become as gestural as his earlier sketches. 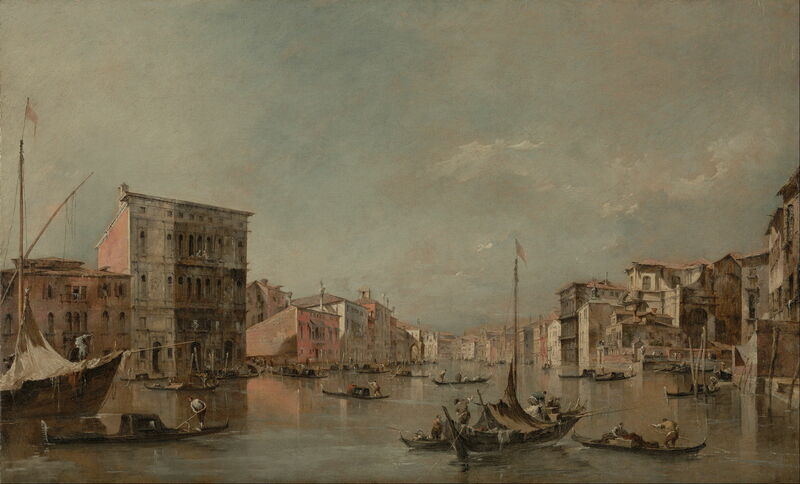 In The Grand Canal, Venice, with the Palazzo Bembo (c 1768), clouds, parts of the water surface, details of boats and buildings, were all being composed of marks, rather than tightly finished. Francesco Guardi (1712-93), The Grand Canal, Venice, with the Palazzo Bembo (detail) (c 1768), oil on canvas, 47 x 76.5 cm, The J. Paul Getty Museum. Wikimedia Commons. This detail shows how, albeit at a fairly small scale, his painting had loosened up and many marks were more gestural. 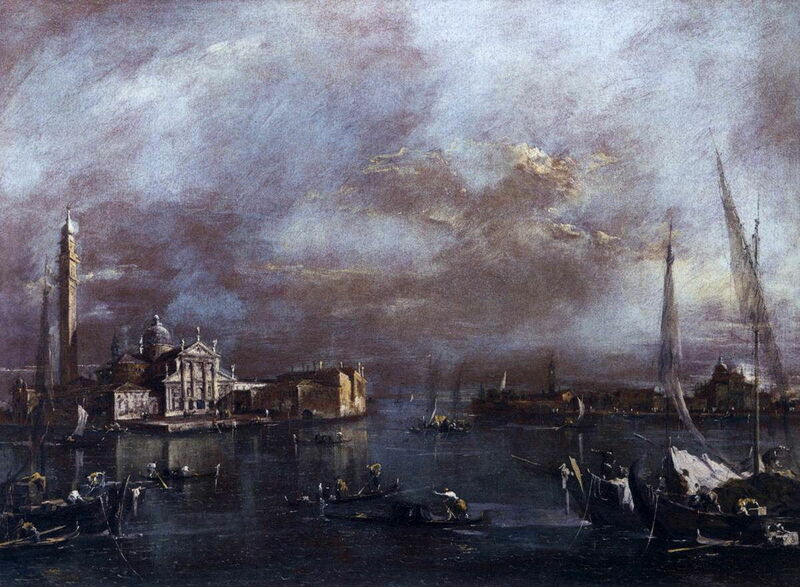 Francesco Guardi (1712–93) Bacino di San Marco with San Giorgio and the Giudecca (1770-4), oil on canvas, 69 x 94 cm, Gallerie dell’Accademia, Venice. Wikimedia Commons. He also painted at least one nocturne, and this twilight view of Bacino di San Marco with San Giorgio and the Giudecca (1770-4). The sky is exceptional for any painting of his day, and probably not matched until later in Turner’s career. 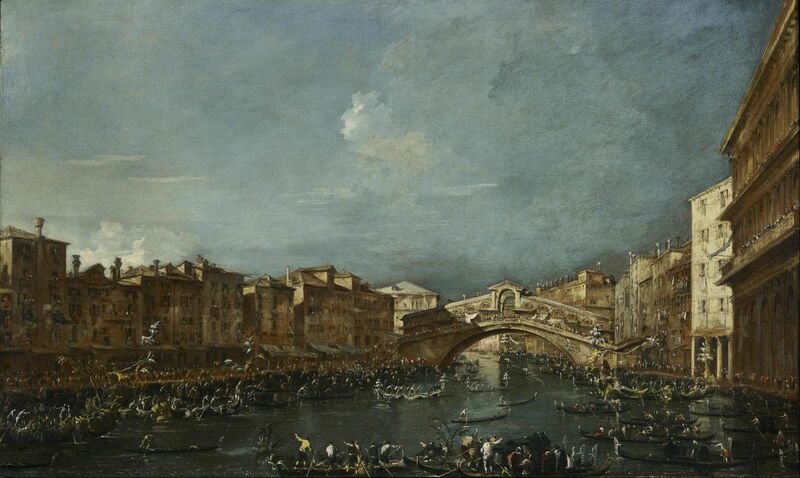 Francesco Guardi (1712–93) Regatta at the Rialto Bridge (1770-9), oil on canvas, 125.7 x 77.5 cm, Museum of Fine Arts, Houston, TX. Wikimedia Commons. Some of his views, such as Regatta at the Rialto Bridge (1770-9) (above) and The Bucintoro Festival of Venice (date unknown) (below), were rather tighter and more formal in style, presumably to satisfy the requirements of the commission. Francesco Guardi (1712–93) The Bucintoro Festival of Venice (date unknown), oil on canvas, 98 x 138 cm, Statens Museum for Kunst, København, Denmark. Wikimedia Commons. 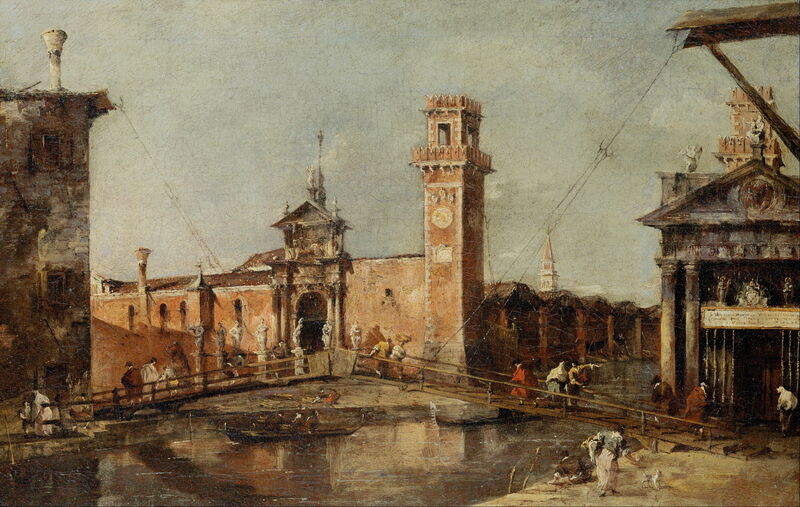 Francesco Guardi (1712–93) The Entrance to the Arsenal in Venice (1777-93), oil on canvas, 29 x 45 cm, Kunsthistorisches Museum, Vienna. Wikimedia Commons. When back working on less formal subjects, and at a more modest scale, the details are once again more painterly, as in The Entrance to the Arsenal in Venice (1777-93). Francesco Guardi (1712–93) Santa Maria della Salute and the Dogana, Venice (1781-5), oil on canvas, 89.9 x 49.8 cm, Museum of Fine Arts, Houston, TX. Wikimedia Commons. Santa Maria della Salute and the Dogana, Venice (1781-5) is another of his later works, with a marvellous sky too. Guardi found greatest scope for his painterly style in his capriccios, which were also considerably smaller in size. 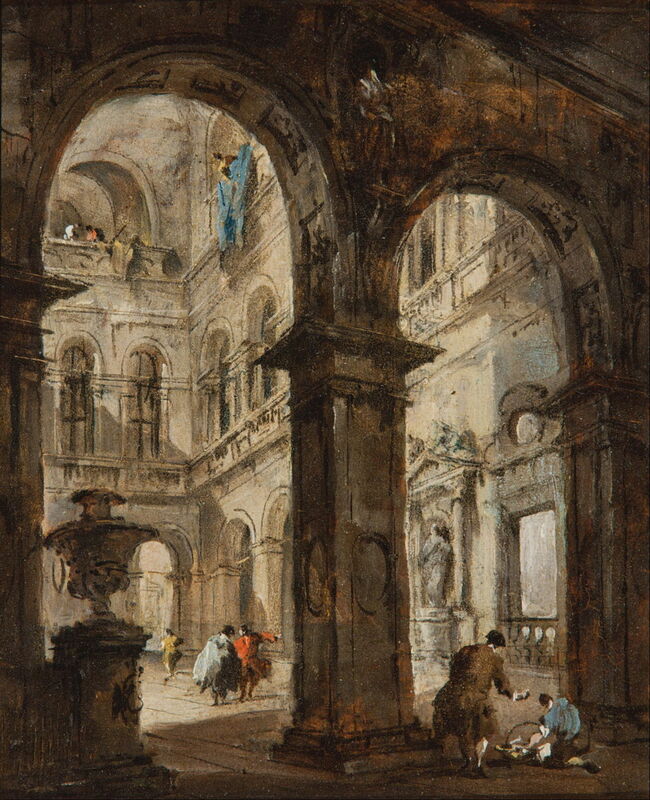 Francesco Guardi (1712–93), An architectural capriccio (date unknown), oil on wood panel, 19 x 15.2 cm, Art Gallery of South Australia, Adelaide. Wikimedia Commons. 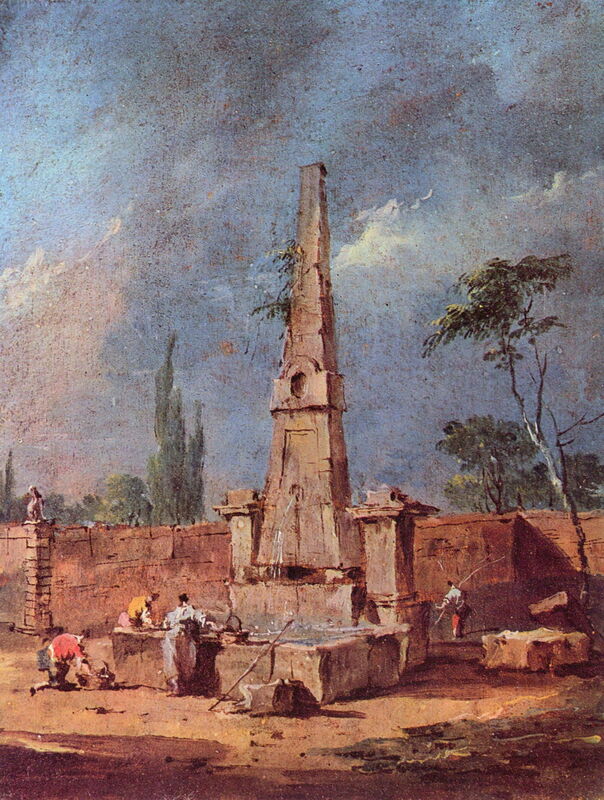 An architectural capriccio (date unknown) has many obvious brushmarks and free application of paint in the texture of the stonework. This detail shows just how sketchy and loose it is. Francesco Guardi (1712–93) An Architectural Capriccio With Figures By A Ruined Arch (c 1770-80), oil on oval panel, 27.3 × 21.9 cm, Private collection. Wikimedia Commons. 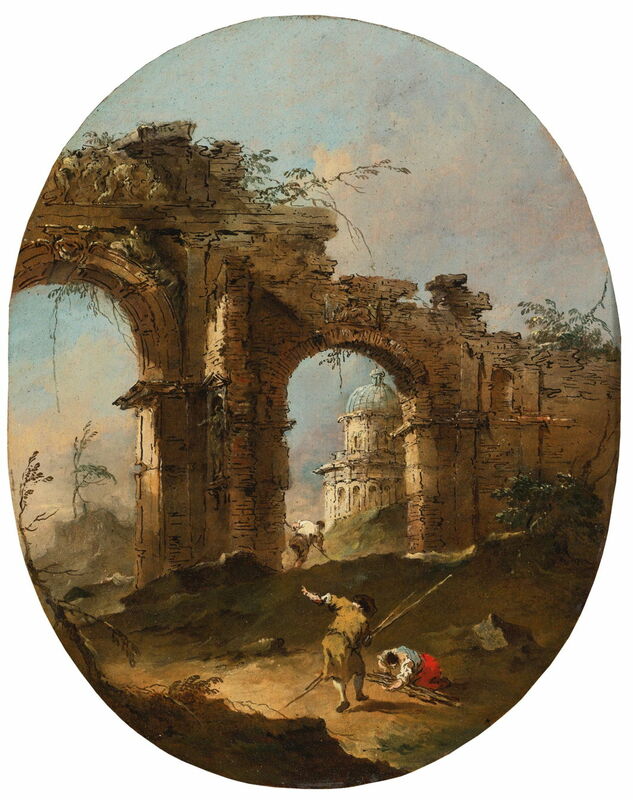 An Architectural Capriccio With Figures By A Ruined Arch (c 1770-80) is a small and freely-painted fantasy, with foliage and decaying stonework tipped in briskly. 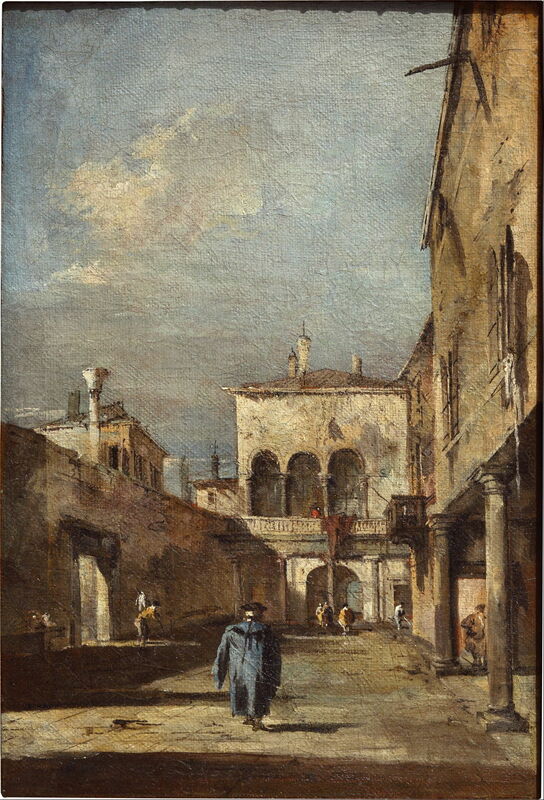 Francesco Guardi (1712–93) Architectural fantasy with a courtyard (date unknown), 38 x 26 cm, Pushkin Museum, Moscow. Wikimedia Commons. Architectural fantasy with a courtyard (date unknown) shows a more open courtyard, with free dabs and strokes of paint to make up most of its details, and loosely-painted clouds above. Francesco Guardi (1712–93) Capriccio (date unknown), oil on canvas, 18 × 15 cm, Private collection. Wikimedia Commons. This Capriccio (date unknown) is even more painterly, in the depiction of water, its sketch-like foliage, and very free sky. 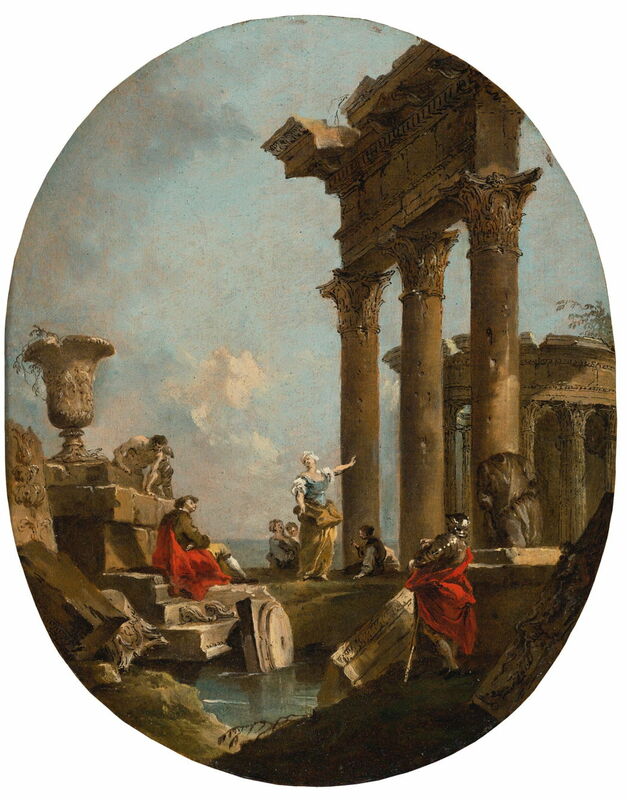 Francesco Guardi (1712–93) An Architectural Capriccio With Figures Amongst Classical Ruins, A Temple Beyond (date unknown), oil on oval panel, 27.3 × 21.9 cm, Private collection. Wikimedia Commons. Even in the more formal An Architectural Capriccio With Figures Amongst Classical Ruins, A Temple Beyond (date unknown), Guardi found the opportunity to sketch in some details, and make gestural highlights, such as those on the armour of the person at the right. It has been suggested that this painting was homage to Panini, whose engraving it appears to be based on. So, he was no herald of Impressionism. But not too long after his death came Constable, Turner, and the singular Carl Blechen. The painterly approach was in the ascendant. Levey M (1980) Painting in Eighteenth-Century Venice, 2nd edn., Phaidon Press. ISBN 0 7148 2002 4. Posted in Painting and tagged Blechen, brushstrokes, Canaletto, gesture, Guardi, Impressionism, mark-making, painting, Tiepolo, Venice. Bookmark the permalink.